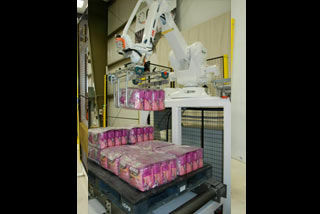 Robust Robotic Bag Palletizer palletizing up to 25 large bags per minute. 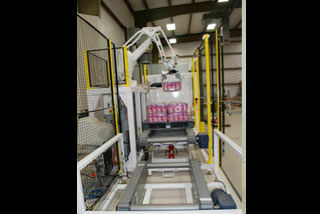 QComp's robotic bag palletizer features a state-of-the-art palletizing robot with long reach and high payload. 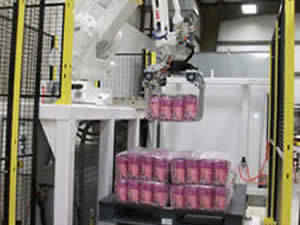 The palletizing system utilizes user friendly software, with capabilities of palletizing up to 25 large bags per minute, the QComp Bag Palletizer more than proves itself when it comes to cost effectiveness. 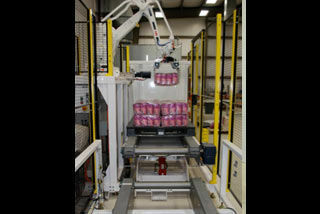 The palletizing robot with long reach and high payload will be utilized in the system. 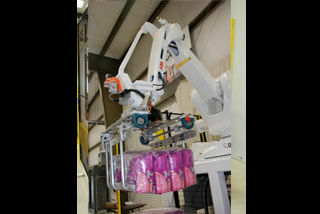 A mechanical clamshell style gripper to pick up bags. The gripper can also be designed to pick up slip sheets and empty pallets if required. 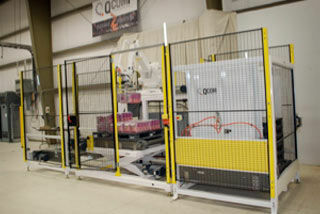 QComp software makes it easy to program the robot for all the palletizing tasks. 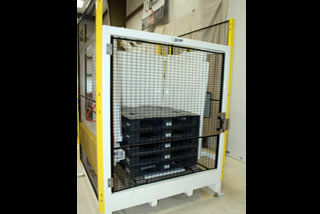 The system can be equipped with a laser guided vehicle to bring empty pallets to the cell and take full pallets back.